Today's only significant data point will be NFP, which is the most significant piece of scheduled economic data every month! When the economy is in a state of change, NFP becomes an utterly dominant force in guiding big-picture trading themes. For instance, NFP results would often set the tone for entire months of trading in the 2008-2014 time frame. But as bonds began to push back toward lower yields after topping out at the beginning of 2014, NFP has had less and less power to serve as the key contributor to momentum. This is an important distinction, because it never gave up the power to drive short-term volatility. Traders will always react in a big way to big beats or misses. The point is that those big beats and misses haven't recently been responsible for lasting trends. This will change as soon as there is a marked change in the tone of the data. Once NFP starts coming in consistently under 200k, that change will have begun. Once there are a few NFP prints under 150k in same quarter, the winds of change may really begin to howl. Today's NFP can't accomplish the change in one fell swoop. It may not even be able to get us to the next major line in the sand from a technical perspective. 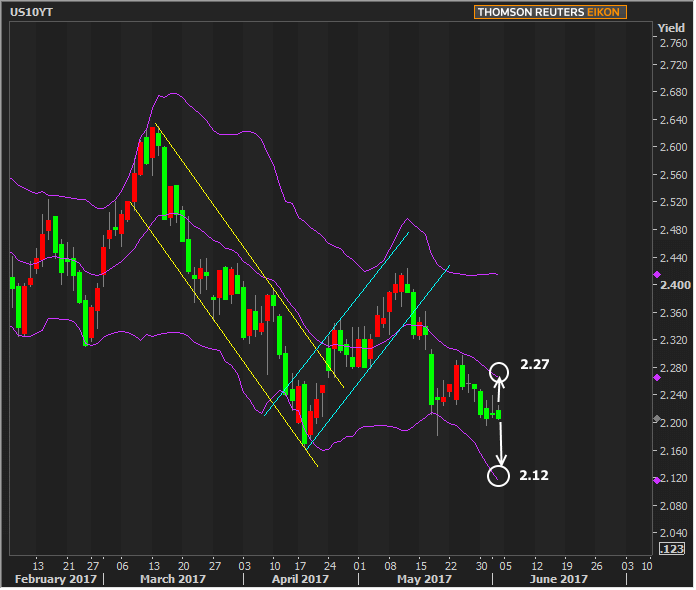 Let's use the middle and lower bollinger bands from the following chart (purple lines). We'd need to break through one of these to conclude a significant response to NFP. I can't help but think the 10 yr bond yield is going to stay over 2.50 for a time along with a higher mortgage rates, and in no time at all I am proven wrong! I guess we should leave the bond yield direction and speculation on short term and long term rates to you Matt!